Everyone loves crispy chicken wings; they make a great party appetizer and are a must on game day or movie night! These crispy baked chicken wings are cooked in the oven making them healthy – well healthier than fried wings. 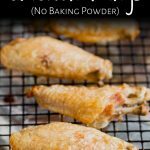 Many baked wing recipes use baking powder, but with this easy method, you don’t need to coat the wings in anything. The secret is to simmer the wings in salted water first. This starts to cook them and melt down the fat. 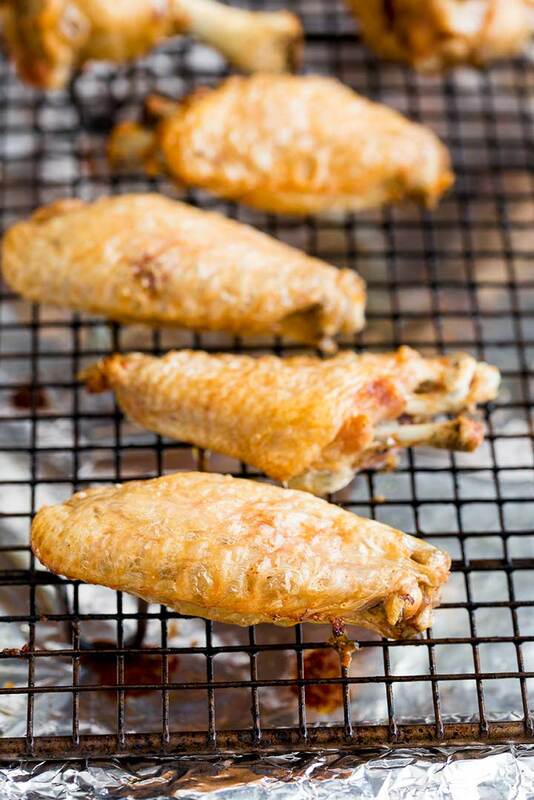 These really are easy baked chicken wings! Add your favorite buffalo sauce, or serve them with a great wing dipping sauce. 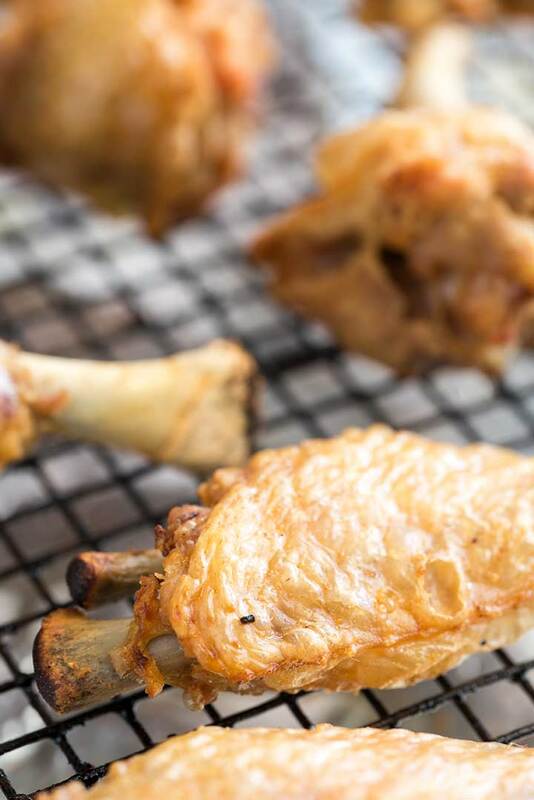 Traditionally to get a super crispy skin on your chicken wings, you needed to deep fry them. Unhealthy and also messy! Then a few years back baked chicken wings became all the rage. And they were good! Coated in a sprinkling of baking powder and cooked low and slow to start and then finished in a hot oven. I found out recently that some people are sensitive to baking powder. It tastes metallic and leaves an unpleasant taste in their mouth! Who knew!!! Apologies to my darling friend who politely spat out her chicken wing!!! So I needed to come up with a new way to get crispy oven baked chicken wings!! And it occurred to me why not try an adaption on my BBQ drumstick method. AND MAN DID IT WORK!!!! These wings are the crispiest baked wings you will ever try!!! They are soooo much better than the baking powder version! Plus because we are just using wings, water, and salt, these babies hit all sorts of dietary levels – Gluten Free, Paleo, Keto, Whole 30, Delicious, Low Carb. Yes, I know “Delicious” isn’t a diet….but for me, it is the only dietary concern I have! But for those people that have to follow a strict diet, these wings will be perfect too. How to cook chicken wings in the oven. This is really “boil then bake chicken wings” as these baked chicken wings don’t start with the oven, they start with a pan of boiling water. Place the wings in a large pan with a tablespoon of salt and then cover with boiling water. Bring them back to a simmer and cook for 10 minutes. I admit by this time the wings will look pretty horrid! But they will have rendered off lots of their fat and the meat will be hot all the way through. Now comes the important stage. Drain the wings and pat them dry with paper kitchen towel. They need to be dry to crisp well in the oven. If you work quickly after draining they will start to steam dry before you can pat them. You want to really make sure they are nice and dry, the drier they are at this stage the crispier the skin will be once they are finished. At this point, the wings can be stored in the refrigerator for up to 3 days. 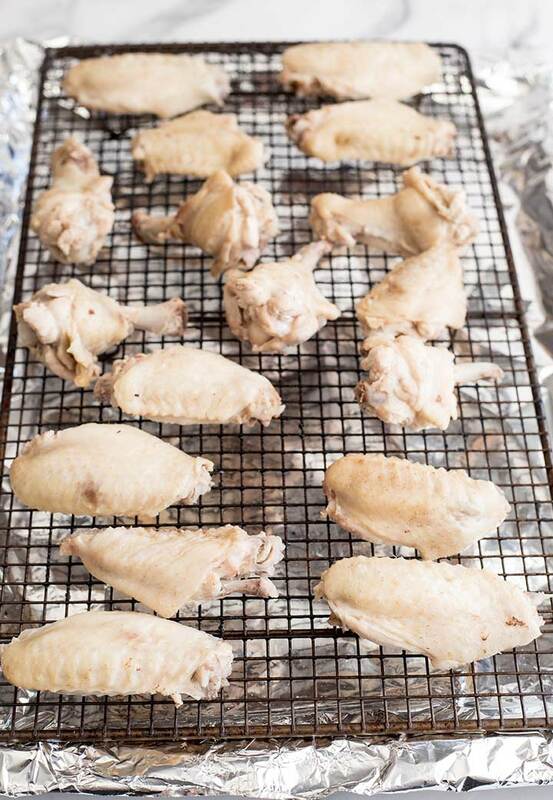 Once the wings are nice and dry, lay them out on a rack over a sheet pan. I like to line the sheet pan with foil to make for an easier cleanup. They then go into the oven to get a crisp skin and golden color. How long to bake chicken wings for? The wings will need 30 minutes at 450ºF/230ºC. Always check that they are nice and crispy and golden brown. Healthy Crispy Chicken Wings Done! Healthy?- How many calories in a chicken wing? A fried chicken wing has around 218 calories in it. Whereas these baked chicken wings have around 82 calories! That is a serious difference!!! Just 3 fried chicken wings provide you with 654 calories. Whereas you’ll be able to eat 8 baked wings for the same calories! Pin this recipe for Crispy Baked Chicken Wings. Pin it here. 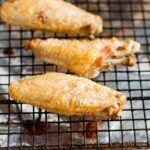 Everyone loves crispy chicken wings; they make a great party appetizer and they are a must on game day or movie night! These crispy baked chicken wings are cooked in the oven making them healthy – well healthier than fried wings. Many baked wing recipes use baking powder, but with this easy method, you don’t need to coat the wings in anything. Making them perfect for Keto, Paleo, Low Carb and Gluten free diets. 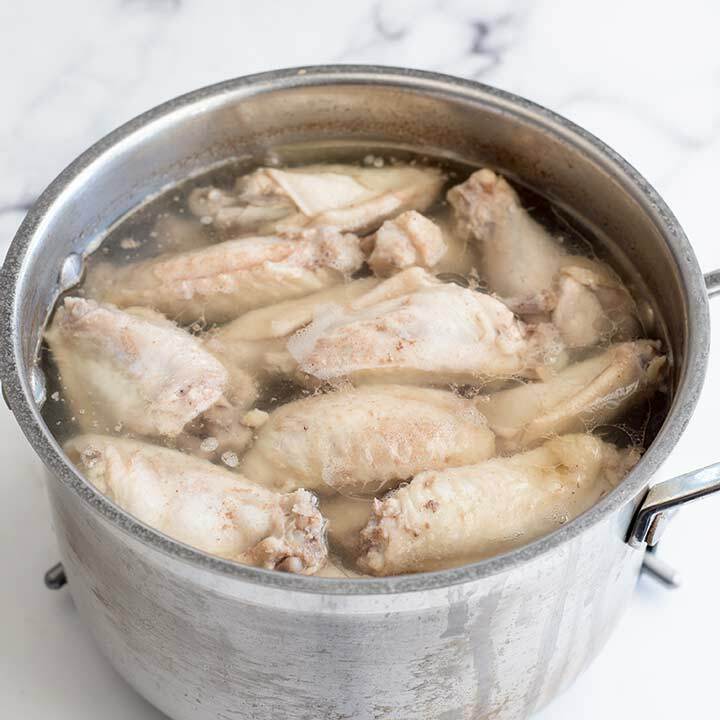 Place the chicken wings in a large pot, add the salt and then cover in boiling water. Bring the water back to the boil, then reduce to a simmer and cook the chicken wings for 10 minutes. Drain the wings well and use paper kitchen towel to pat them as dry as you can. 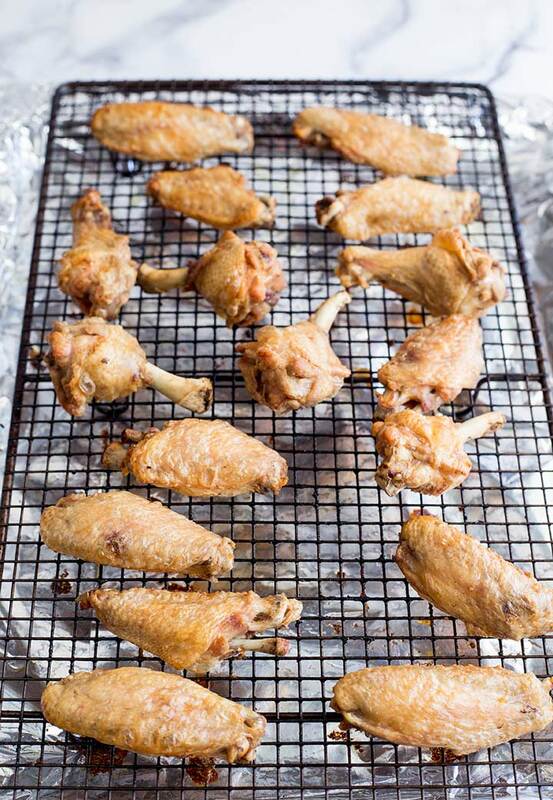 Bake the chicken wings for 30 minutes until the skin is crisp and golden. Love this technique and I’m glad I don’t need to deep fry *or* use baking powder! Thanks so much! I love my baked chicken crispy and this recipe is super easy to do. Thanks!